Leaving Page your flight will encompass the Glen Canyon Dam, Wahweap Marina and the beautiful contrasts of the striking blue/green waters of Lake Powell and the surrounding desert landscapes. Just before reaching Navajo Mountain, depart the lake to fly over the immense span of Rainbow Bridge, the world's largest natural stone bridge. After a short trip over the rugged canyon lands of the Utah/Arizona border you will reach the familiar spires, buttes and mesas of Monument Valley. Here you board a four-wheel drive vehicle for a two-hour voyage through the most dramatic rock formations of the Colorado Plateau. The rich history and impressive monuments will captivate you. 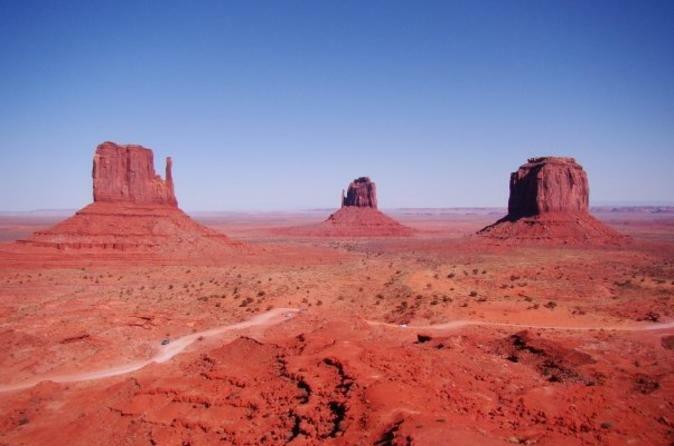 You may even recognize scenes right out of your favorite western movies. After your tour savor a delicious Navajo Taco lunch at Goulding's Lodge before your return flight to Phoenix. A minimum passenger surcharge may apply, please see Additional Info for full details.